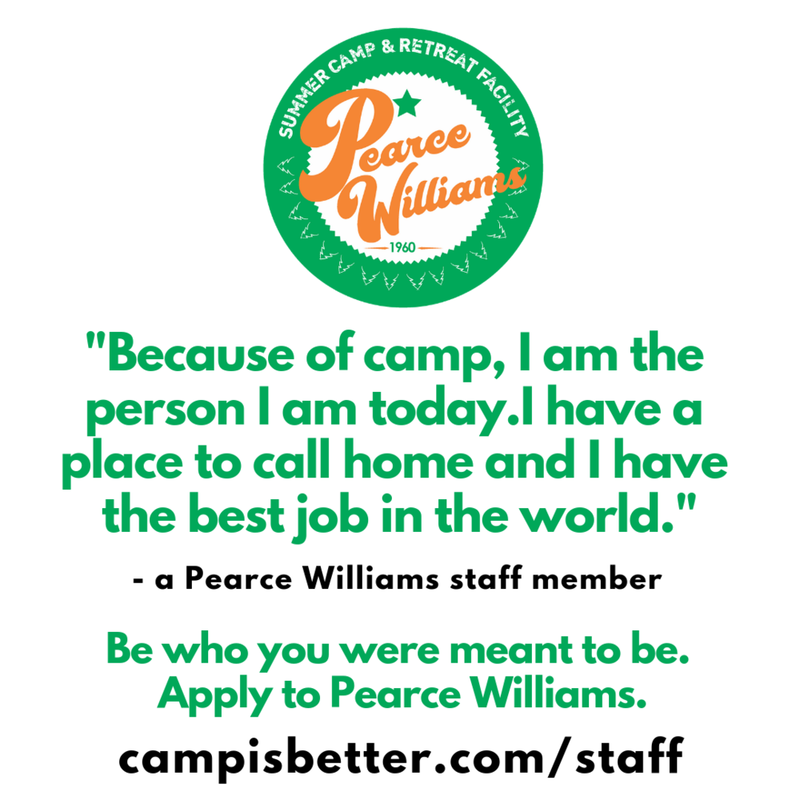 At the end of the summer at Pearce Williams we ask our staff to finish the following sentence: “Because of camp I…” It was very interesting to see our staff’s responses to this simple statement. Because of camp I am able to be 100% me. Because of camp I have learned to appreciate the small things more than ever before. Because of camp I have been inspired to appreciate each moment individually and each person differently. Because of camp… I have confidence, strength and courage. I am willing to challenge myself and accept failure knowing I will one day succeed. I have created lifelong friendships with the people that inspire me the most. Because of camp I am the person I am today and will forever be grateful, I have a place to call home and I have the best job in the world. Because of camp I am able to get in front of any crowd and feel relaxed. I have been able to grow in confidence, and can firmly say that I know what I want to do with the rest of my life. Because of camp I know that I want to spend the rest of my life working with kids! Because of camp I believe in the youth of our generation. Because of camp I can be who I want to be not who other people want me to be. Because of camp I have realized the who God wants me to be, it has shown me my strengths and weaknesses, my inside and out. I have learned to keep the friends I have made at camp very close for they have my back and I have theirs and what it truly means to work as a team. I have learned how to truly dare greatly! Because of camp, I am able to be completely myself without being judged, I am able to be inspired by every single camper that comes to camp, I am able to appreciate every moment of life because camp had shown me just how special they are. Because of camp I have grown so much and will continue to grow as a person. Because of camp I have confidence and direction for the rest of my life. Because of camp I got the opportunity to go out of my comfort zone and make new friends and explore new places. Because of camp I have been able to see a noticeable change in myself (for the better) and have been able to make friends that will last a very long time. I also find myself very relaxed, a feeling which is not usually present in my life. Because of camp I feel like Lora is just a name and behind it is the person I have constructed to fit into society and their expectations of me where as Bam Bam is my identity, it is who I want myself to be. Because of camp I get to surround myself with people, staff and campers alike, that inspire me every single day. These people have also allowed me to discover myself, and to grow into the best me I can be. Because of camp I will be changed for the better. Camp is a powerful place for our campers, but also a powerful place for our young staff to grow and become their true selves. Get ready for a summer of change, growth and the best summer job you will ever have. The Best Gift You Can Give A Child - Camp!